Western extremity of the vast Eurasian continent that, by convention, is separated from Asia by the Ural Mountains; it covers a relatively small area. Area of the Mediterranean Sea between Turkey and Greece; it contains numerous islands, the largest of which is Crete. Area of the Arctic Ocean lying north of the Scandinavian Peninsula and Russia; it is partially ice-covered. Europe’s largest lake (17,700 km2) is located in Russia; it empties into the Baltic Sea. Peninsula comprising Spain and Portugal; it extends from the Pyrenees to the Strait of Gibraltar. Mountain range whose northern slope is in France and whose southern slope is in Spain; Pico de Aneto (3,404 meters) is its highest peak. Largest mountain mass in Europe, extending 1,200 km; Mont Blanc (4,807 meters) is its highest peak. Second longest river in Europe (2,850 km); it flows into the Black Sea through a vast delta with three branches. Mountain range in central Europe, lower than the Alps; its highest point is at an elevation of 2,655 meters. Section of the Atlantic that separates Great Britain from Ireland. Relatively shallow sea between France and England; its extreme tides cause strong currents, making navigation difficult. The world’s second largest ocean; it covers 20% of the Earth’s surface. Poland’s principal river (1,090 km) has its source in the Carpathians and joins the Baltic Sea at the Gulf of Gdansk; it is ice-covered two to three months per year. Relatively shallow sea (570,000 km2) in the North Atlantic and bordered by the coasts of Europe; some major European ports are located along its estuaries. One of the world’s largest inland seas, bordered by Europe, Africa and Asia; it connects to the Atlantic Ocean through the Strait of Gibraltar. Channel (15 km wide) between Spain and Morocco; it connects the Mediterranean to the Atlantic and is an important shipping route. Mountain range extending 2,400 km from the Caspian Sea to the Arctic; it is traditionally considered the boundary between Europe and Asia. The longest river in Europe (3,700 km) is ice-covered three to four months per year; its spring flood is substantial. River in Russia (2,200 km) whose flow is slow but abundant; it is a major communications artery. Gulf of the Mediterranean, 835 km long and 180 km wide, located between Italy, the former Yugoslavia and Albania. 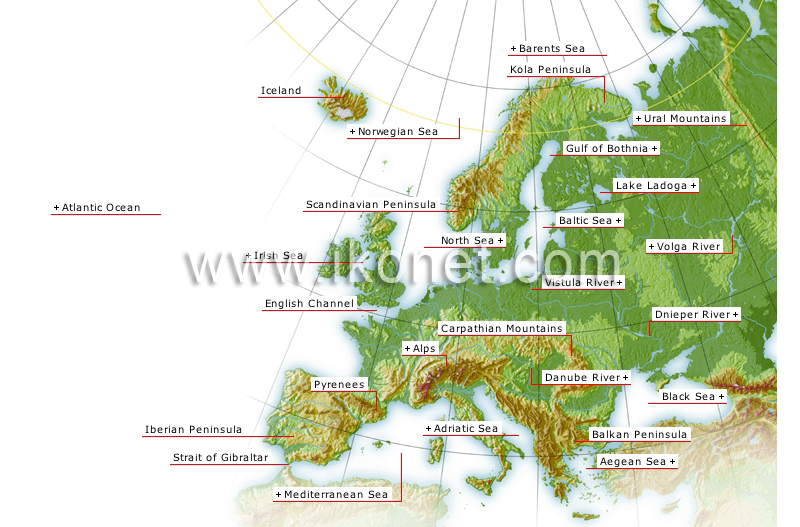 Mountainous, easternmost peninsula of Europe whose crumbling coastline features peninsulas and scattered islands. Inland sea (420,000 km2) between Eastern Europe and Asia; it opens into the Mediterranean through two straits, the Dardanelles and the Bosporus. Generally shallow inland sea that is low in salt content and devoid of major tides; it freezes along its coasts. Vast Nordic peninsula that includes Norway, Sweden and part of Finland. Relatively shallow Gulf between Sweden and Finland; it is often icebound. Volcanic island subject to regular earthquakes; it has over 5,000 km of coastline. Section of the Atlantic between Norway to Iceland. Mostly mountainous peninsula located in Russia, above the Arctic polar circle.